'See Britain!' jokes the sophisticated stewardess to a young boy from rural Pakistan catching the English winter and its first fever on the plane's steps. 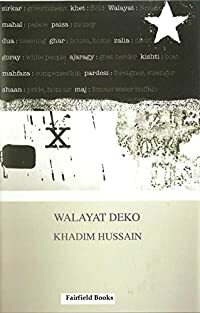 Khadim Hussain's poems chart the highs and lows of countless such arrivals: dreams of prosperity that wake to mixed realities; memories of home irretrievable from time's blank floods. He captures changing perspectives with bittersweet tenderness and wit, with inventive and revealing shifts of diction, rhythm and tone. Hussain draws impressively on his historical knowledge and deep roots in the Asian community and, sometimes with a humorous flourish, sometimes with a profoundly moving vision, contemplates past, childhood and tradition in Pakistan and confronts realities and identity in modern Britain. Andy Willoughby, Teesside poet and editor with 'Ek Zuban'. Khadim Hussain's work carries all the ins and outs of Asian culture and heritage and will be read by all with a lot of interest. he is so much more than a local writer and is worthy of wide renown. Hazrat Shah, Urdu poet and editor with Aaina and Tadeeb International.